Rose gold engagement ring bears 3 brilliant-cut cubic zirconia in 3 stone setting and is lavished with small cubic zirconia rounds on sides. 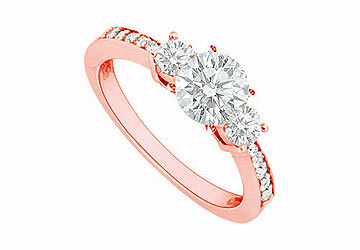 1 carat engagement ring is crafted in 14kt rose gold and is perfect for April gifting and 10th anniversary gifting. 3 stone cubic zirconia engagement ring.